An evening pause: A very nice performance. Hat tip Edward Thelen. After four years in orbit around Mercury and eleven years in space, engineers have confirmed that Messenger has crashed into Mercury. A new audit by he IRS inspector general has concluded that the agency has taken “significant actions” to end the harassment of conservative groups. The agency’s inspector general says the IRS is doing a better job processing applications for tax-exempt status. His report said the IRS has eliminated intrusive, unnecessary questions, and has cleared a backlog of applications that had languished for months and years. One of the reasons these harassment tactics have stopped is that most of the IRS management involved in the scandal has been replaced. I wouldn’t rest easy, however. The majority of federal employees are liberal Democrats, and many would be glad to lend a helping hand to that party if they could. Right now they are being careful because they know they are being watched. The second we stop watching them is when we can expect them to start some form of harassment of conservatives again. And anyone who thinks I am being paranoid I think is being naive. Students at Rice University have built a chair and table expressly designed for use in a low gravity environment like the Moon or Mars. The students interviewed astronauts to get an idea of what was needed, and did the design under NASA supervision. Their design is clever in that it can be packed easily, but I still wonder about the weight of transport. I don’t see the first explorers to Mars being able to afford bringing their furniture with them. I expect they will instead figure out ways to improvise chairs and tables from the materials on hand. The competition heats up: Blue Origin completed on Wednesday its first test flight of its reusable suborbital spacecraft, New Shepard. After reaching an altitude of 307,000 feet, or 58 miles, the capsule successfully separated from its first stage, what they call the propulsion module, and safely parachuted back to Earth. The first stage, designed to also be recoverable, was not recovered successfully. According to Jeff Bezos’s explanation, they “lost pressure in our hydraulic system” and that they were trying to land it vertically, like SpaceX’s Falcon 9 first stage. The cropped image on the right of the full resolution image, gives us a close-up of the capsule and propulsion module. The small fins on the propulsion module suggest the capability for a vertical landing, but it is unclear from the image whether the module has legs, though other images and videos strongly suggest there are legs on this module. The flight itself, getting above 50 miles, reached space according to most definitions. In fact, Blue Origin with this flight has accomplished what Virgin Galactic has been promising to do for more than a decade, a suborbital test flight of its spacecraft. 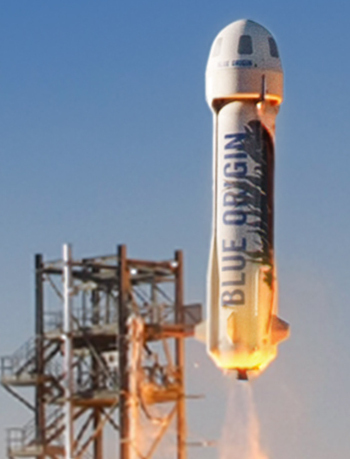 Blue Origin’s flight was unmanned, but it demonstrated that their design works. They will of course have to re-fly the capsule as well as land that first stage successfully to prove the design’s re-usability, but this flight shows that they are off to a very good start. And their webpage clearly shows that they are almost ready to start selling tickets for suborbital flights. The most significant success of this launch, however, is the performance of the BE-3 rocket engine. Blue Origin has convinced ULA to hire it to build the engines for its new Vulcan rocket. This success justifies that decision. I have embedded their videos of the full flight below the fold. An evening pause: Time for more silliness, with a bit of gentle humor making fun of those among us who are most philosophical. Images taken between April 12 and April 18 by New Horizons of Pluto not only show one complete rotation of the planet as well as its moon Charon, the images also show a bright spot at Pluto’s pole that could be a polar cap. The article calls it an “ice cap” but that is premature. At Pluto that cap could be made of a number of materials, not just water. We will not know until New Horizons gets closer. Is it dark matter, or a previously unrecognized failure of Newton? 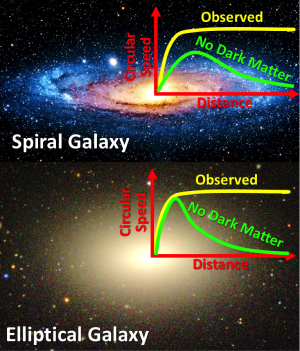 The uncertainty of science: Using new data gathered by the 10-meter Keck telescope in Hawaii, astronomers have found that the outer stars of elliptical galaxies exhibit the same behavior as the outer stars of spirals, suggesting once again the existence of dark matter. One of the most important scientific discoveries of the 20th century was that the spectacular spiral galaxies, such as our own Milky Way, rotate much faster than expected, powered by [the] extra gravitational force of invisible “dark matter” as it is now called. Since this discovery 40 years ago, we have learned that this mysterious substance, which is probably an exotic elementary particle, makes up about 85 percent of the mass in the Universe, leaving only 15 percent to be the ordinary stuff encountered in our everyday lives. Dark matter is central to our understanding of how galaxies form and evolve – and is ultimately one of the reasons for the existence of life on Earth – yet we know almost nothing about it. What is most fascinating about this press release, however, is that it also noted that dark matter is only one explanation for the data, and that the failure of Newtonian physics at large distances, instead of dark matter, might also provide an explanation. However, the [solution] does not come out naturally from models of dark matter, and some disturbing fine-tuning is required to explain the observations. For this reason, the [problem] even led some authors to suggest that, rather than being due to dark matter, it may be due to Newton’s law of gravity becoming progressively less accurate at large distances. Remarkably, decades after it was proposed, this alternative theory (without dark matter) still cannot be conclusively ruled out. Physicists call this other theory MOND, for modified Newtonian dynamics. It is not a very popular theory, however, and is almost always ignored, even though it appears to work as well as dark matter to explain the motion of stars in galaxies. Instead, most scientists favor dark matter. For this press release to mention it as suggests the new data favors it over dark matter, which would make this a significant discovery. The science team for Rosetta’s navigation camera have released to the public 1297 images taken of Comet 67P/C-G as the spacecraft began its approach on August 1, 2014 through September 23, 2014. The release also included a video assembled from these images, showing the comet nucleus as Rosetta approached from August 1 to August 22. I have embedded that video below. As you watch, you will think, “How does this thing stay together?” Though the video shows the nucleus’ rotation at a highly accelerated rate, which exaggerates the stresses on the object, the question is a good one, and in fact, is actually predicting the future. Eventually, this nucleus will break up. Like Detroit, Atlanta, St. Louis, Chicago, and a host of other major metropolitan cities that are disasters for the middle class and the poor, Baltimore has been run by Democrats as a one-party monopoly for literally generations. The disasters we are seeing there have nothing to do with Republican policies, and everything to do with the terrible and failed policies of the progressive left. They are to blame, but they keep trying to spread that blame around. It is time for Americans to see them for what they are — failures — and to stop voting for them. Republicans certainly don’t have all the answers, and should certainly be fired quickly if they fail to serve the public, but Republicans also have had nothing to do with the failures of the inner cities. The most important thing a free person has is the freedom to choose. I pray that inner city Americans, both black and white, finally realize that it is time to choose differently. Working for the Democratic Party: Emails by Lois Lerner that IRS head John Koskinen has sworn were lost forever and could never be recovered have miraculously been rediscovered by the IRS’s inspector general and will be turned over to Senate investigators. An evening pause: A remarkable performance, using juggling to play music. Stay with it, it only gets better. Finding out what’s in it: Two thirds of taxpayers have had to repay a significant portion of the subsidies they received through Obamacare this year when it came time to do their taxes. And it ain’t gonna get better, only worse. But don’t worry, it is really the Republicans’ fault for not writing or voting or even conceiving of this Democratic Party law. The Democrats are perfectly innocent of any blame at all for writing it, forcing it through (against the wishes of a majority of the population), and doing so without even reading the damn bill in the first place. If we vote for more Democrats and more laws like this, things have just got to get better! An evening pause: One of the many classic scenes from the classic Hollywood masterpiece, Adam’s Rib (1949). Another hat tip to Phil Berardelli, author of Phil’s Favorite 500: Loves of a Moviegoing Lifetime. For those willing to stay up a bit late, I will be appearing on Coast to Coast tonight from midnight to 2 am (Pacific), talking about my book, The Universe in a Mirror, and history of the Hubble Space Telescope as it celebrates its 25th anniversary in orbit. The competition heats up: SpaceX has successfully completed its fifth Falcon 9 launch of the year, putting a Turkmenistan’s first communications satellite into orbit. This was the 18th consecutive successful launch for the Falcon 9, and the 13th in a row for its upgraded design. 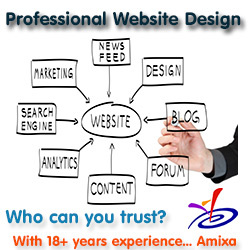 Not bad for a company that did not even exist a little more than a decade ago. Having firmed up the May 20 launch date for the next X-37B mission, the Air Force has also revealed one of the experiments the reusable mini-shuttle will carry. They will be testing in orbit an advanced ion engine. I suspect however that this is not the only experiment on board. The law is such an inconvenient thing: The Supreme Court has thrown out another lower court decision that had favored the Obama administrations’ Obamacare contraceptive mandate imposed on Catholic businesses. What is telling about this is that the Obama administration keeps fighting these cases, even though it is very clear from all its rulings that the Supreme Court has rejected the mandate as hostile to religious freedom. What they should do is sue the court for dismissal and stop trying to impose the mandate in all cases. But they don’t. This is not only a waste of resources, it indicates that Obama and his administration really don’t wish to follow the court rulings, and instead want to impose their will regardless. By fighting this case by case, they are hoping to wear down the religious. In essence, the Obama administration is thus reveals itself hostile to the law itself. Under pressure from many circles to open up its processes for naming objects in space, the International Astronomical Union (IAU) has started a contest to allow non-profits and “registered clubs” to compete to name 20 exoplanets. Each organisation can submit one naming proposal, for one ExoWorld only. The number of names that need to be submitted depends on which system is selected. For single- and multiple-planet systems, a name for each planet must be submitted, as well as one for the host star. In the 20 ExoWorlds list, five stars already have common names. Consequently, these five stars cannot be considered for public naming. There are 15 stars and 32 planets (47 objects in total) available for naming. The name of the 20 host stars are explained and personal messages from some discoverers are also available here. To participate in the contest, clubs and non-profit organisations must first register with the IAU Directory of World Astronomy. The deadline for registrations has been extended to 23:59 UTC on 1 June 2015. You will note that this contest is not open to the public, but to clubs and organizations that the IAU approves. This is typical of the IAU, which wants to retain its power to name everything in space. They are thus keeping this whole process close to the vest and tightly controlled. In the end it won’t matter, as the names will eventually be chosen by those who go there, or by those who make the discoveries. It would be nice, however, if the IAU would simply recognize this fact. The competition heats up: The next commercial Falcon 9 launch is now set for tonight, Monday, less than two weeks after the last Falcon 9 launch. The next two weeks will be especially busy for SpaceX, as they also have scheduled the first launch abort test of Dragon on May 5. The launch will also be the fifth for Falcon 9 this year, putting it in the lead as the busiest rocket in the world for 2015, ahead of the Russian Soyuz. The heat of competition? In order to meet a government deadline to launch humans from their new spaceport at Vostochny, the Russians had planned, though now cancelled, a single manned launch there in 2019, using a new rocket. Their cancelled plans had included two prior test flights of the rocket with Progress freighters. If cargo missions were successful, the one brave crew would ride into orbit from the new spaceport, knowing that in case of a serious problem with the rocket, the descent module of the spacecraft would parachute into deep forest of the Russian Far East or somewhere in the Pacific. After “satisfying” this political goal with a single crew, all manned Soyuz and cargo Progress missions would then revert back to Baikonur for a safe ascent trajectory. The Soyuz spacecraft would continue flying two missions annually from Baikonur, until the veteran spacecraft’s final launch in 2025. In 2021, Soyuz spacecraft missions originating from Baikonur would switch from Soyuz-FG to Soyuz-2-1a rocket. The Russians have now decided, rather than rush this first flight on the new rocket, to hold to the slower schedule. This story is important to the United States. I think we must definitely end our dependence on the Russians before they make the switch to the new rocket. Based on the levels of poor quality control and corruption seen recently in Russia, I have grave doubts the new rocket will fly reliably at first. It would be a mistake to buy its use to put Americans in space. After a brief delay when the spacecraft went into safe mode due to a communications issue, Dawn has now begun its research phase around Ceres. The uncertainty of science? A panel of five scientists has been formed to review the adjustments to the global temperature data at NOAA and the Goddard Institute of Space Studies (GISS) that have consistently cooled the past but warmed the present, thus creating the illusion of more warming than the raw data suggests. Careful analysts have come up with hundreds of examples of how the original data recorded by 3,000-odd weather stations has been “adjusted”, to exaggerate the degree to which the Earth has actually been warming. Figures from earlier decades have repeatedly been adjusted downwards and more recent data adjusted upwards, to show the Earth having warmed much more dramatically than the original data justified. So strong is the evidence that all this calls for proper investigation that my articles have now brought a heavyweight response. The Global Warming Policy Foundation (GWPF) has enlisted an international team of five distinguished scientists to carry out a full inquiry into just how far these manipulations of the data may have distorted our picture of what is really happening to global temperatures. The global warming scientists at NOAA and GISS are finally going to challenged to explain their adjustments, something they have so far refused to do. For my part, I will be very surprised if they can come up with a scientifically justified explanation. Like the author, I remember every single one of these doomsday predictions. I also remember how every single one of these predictions was wildly wrong. Until these fear-mongers can reliably predict things, I see no reason to believe them. You know how old I am? I’m so positively ancient that I remember when one of Jimmy Carter’s big answers to the impending shortage of oil was to increase federal funding for research on how to extract oil from shale. It ended the way you would expect: it went nowhere. But some decades later, private oil companies did find a way to more economically extract oil from shale—and environmentalists promptly made it public enemy #1. All true. And just one more example of how the government fails at something while private enterprise, fueled by the profit motive, finds a way to make that exact same thing happen. Cool image time! In their weekly release of new images, the hi-resolution camera team for Mars Reconnaissance Orbiter have posted a wonderful image of the complex layering and terracing inside Spallanzani Crater, located in the high latitudes of the red planet’s southern hemisphere. The image on the right is only one small section of the much larger image. So what is the composition of these layers? Spallanzani Crater lies in the high latitudes of the Southern hemisphere (around 60 degrees in latitude) so there is a good possibility that the deposits are ice-rich. If we look more closely we will notice fractured mounds, which sometimes indicate the presence of subsurface ice. 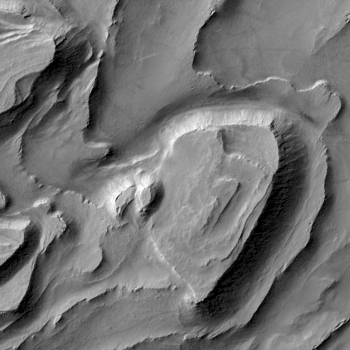 Another interesting observation is the presence of grooves in the shaded slopes of some of the layers. 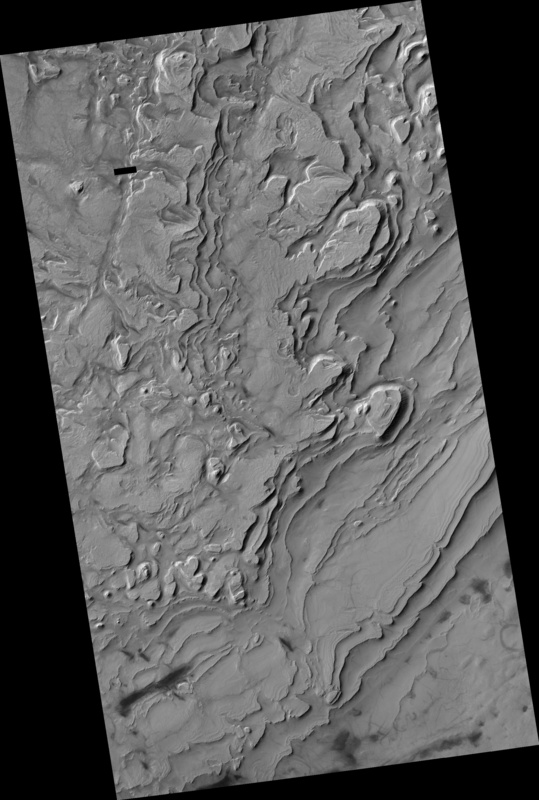 Perhaps these grooves formed because of the sublimation (the direct transfer of solid ice to water vapor) of ice from these slopes since slopes tend to get warmer than the surrounding terrains. This image hardly shows a breakthrough discovery, but I like it because it illustrates nicely the wonderful but very alien landscape of Mars. To walk its surface will be a daily adventure for its first colonists. Try to guess of whom we are speaking. Try. I will give you one hint: In this particular case it is not Islam, though trying to distinguish the difference is getting exceedingly difficult.